There will also be an exhibition of photos from “Alive Day Memories,” portraits of soldiers injured in the Iraq and Afghanistan Wars by Timothy Greenfield-Sanders. New Yorkers have always been visionaries. SPEAK UP is a way to begin to reclaim the voice of our city as revolutionary, awake, and democratic. SPEAK UP is meant not only to encourage empathy and compassion, but also to provide New Yorkers with concrete options for action. In this benefit concert, New York musicians will be joined by speakers from the worlds of politics, media, war and social justice in a call for action. 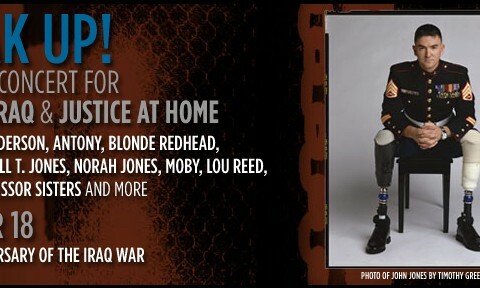 Join us for a powerful evening of music and activism on the eve of the 5th Anniversary of the War in Iraq.